Since she can remember, Katarina's relatives have been grooming her for the family business — thieving. But when Kat tries to go straight and leave the Life for a normal life, she's promptly kicked out of her new school for stealing the headmaster's car and mounting it on the school fountain. Although she could have done it without breaking a sweat, ironically, this time, she's innocent. In fact she was framed — by another highly-skilled thief. Her friend and brother-in-trade Hale, with his mischievous smile and limitless bank account, has appeared out of nowhere to bring her back to the Life, back to the family Kat tried so hard to escape. Hale has a good reason: A powerful mobster has just been robbed of his priceless art collection and he wants to retrieve it. Only a master thief could have cracked this vault, and Kat's father isn't just on the suspect list, he IS the list. Now, caught between Interpol and a far more deadly predator, Kat's dad needs her help. For Kat, a consummate thief in her own right, the solution is simple: track down the paintings and steal them back. So what if it's a spectacularly impossible job? She's got two weeks, a teenage crew, and maybe just enough misguided pride to pull off the biggest heist in history — or at least in her family's (very crooked) history. 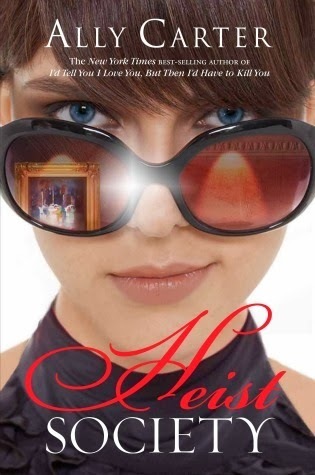 Heist Society is essentially a teen heist novel. Realistic? Maybe not. Hale sure isn't. Fun? Yes, it's definitely that. Good enough to keep going with the series? Well, maybe not. There are definitely things to like here. The characters, especially Kat, reasonably act and sound like teens who grew up surrounded by organized, career criminals. For the most part, I found their actions and reactions believable, and they were mostly likeable without being dull and overly perfect. I also loved that Carter quietly made this book about more than just a daring art theft. As Kat discovers, the paintings she's been set to retrieve were looted by Nazis in the 1930s. At this point, Carter could have thrown the rest of the story out the window and hammered on this one point. And she didn't. It takes a good bit of restraint to let a (sadly, realistic) plot point about Nazis remain in the background for much of the book. That said, I was reminded a few times that I'm not really the target audience anymore. Hale is a strange character, complete wish fulfillment for Kat. He's rich, he's handsome, he fits into her world, and he's (apparently) exclusively interested in her. As a whole, he just isn't believable. That said, when he's interacting with Kat and money (specifically, his oodles and oodles of it) isn't entering into the conversation, I like him, and I like how he interacts with Kat. But as a whole, he just didn't work for me. And even at the end of the book, I'm still confused as to why Kat originally left the criminal life in the first place. Attack of conscience, I guess, but what prompted it? I kept waiting for an explanation, and I just didn't get one. Right now, I'm not sure if I'd read any further in this series. On one hand, I do like most of the characters, and I think Carter is good at writing believable interactions between them. I like the Robin Hood-esque direction that Carter seems to be taking Kat in, and I think this could end up being a fun, exciting series. But I do have my doubts about how things will develop going forward. Side note: if the idea of looted art really interested you, I'd recommend reading Loot: The Battle over the Stolen Treasures of the Ancient World for the real-world debate that Carter only touches on here.